Squash flatbread recipe using acorn squash uses oven roasted mashed acorn squash to make easy, tasty and healthy Indian style squash flatbread or squash chapathis. Add the salt, 1 tablespoon of oil and cumin seed powder to the roasted and mashed acorn squash, mix very well, keep this aside. In a large bowl, add the wheat atta flour and enough salt, mix well to combine. Add the mashed acorn squash to the flour and mix well with your hands, forming the dough. Add the remaining oil to the dough, mix and knead the dough again for few minutes to form the dough ball. In case, the dough is sticky, you will have to add more flour little by little until the desired consistency is attained to make the Indian flatbread chapathi (the dough shouldn't be wet or sticky but soft so you can form the balls and roll them easily to make the flatbread). Cover and let the dough rest for at least half an hour. Make equal medium sized balls out of the dough, keep this aside. I made 8 equal sized balls from the dough. Dust a flat surface with little flour and roll the first dough ball in circular shaped flatbread in even thickness. You may use a little oil of extra flour to make the rolling more easy, if necessary. Grease a hot iron pan or non stick pan with ghee or little oil and transfer the rolled faltbread or chapathi to the hot pan. If you are using non stick pan, using ghee or oil is not necessary, but it will definitely add much flavor to the flatbread if you use. Cook the flatbread for about a minute or until the bottom side is cooked, then flip and cook the other side too which will take a couple of minutes, depending on how hot your stove it. Make sure not to keep your stove on very high heat to avoid burning the flatbread or chapathi. Roll all the balls and cook the flatbread until the dough is finished. Serve the squash flatbread with any vegetarian curry or yogurt or raitha (yogurt based salad) for a healthy and tasty lunch or dinner! 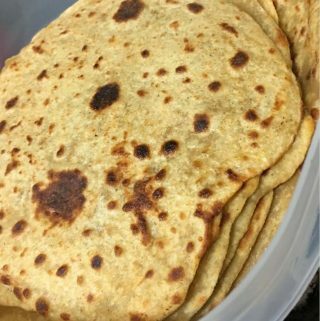 Notes: If you are serving the flatbread later, I would recommend keeping the warm chapathis closed in an airtight container so that they will remain soft.